B2B marketing videos have become more than a cool trend. Want to know why? Did you know 60 to 70 percent of people are either visual or auditory learners? Given that video appeals to both, it is no wonder that 51.9% of marketers consider video as having one of the best ROI according to CopyPress´ 2013 State of Content Marketing Study. But the fact of the matter is that not every video will perform in the same way, which also means that using B2B marketing videos is not a guaranteed strategy, so here is how you can make your web video your #1 sales tool! To generate customer with videos as part of your B2B marketing strategy with video, your videos need to be seen. By having a video you are already 50% more likely to appear on the first page of Google as reported by Wistia. Your competition is also less given that there might be thousands of articles or blog posts about a subject yet only a few hundred videos. Is not magic, it requires a lot of thinking and testing, but the results are worth it. To maximize your visibility through search engines takes a little tweaking of your title, writing a powerful and descriptive video description and the inclusion of the right keywords. A few ways to get started are to use Google autocomplete or search for trending words to see what people are searching for today. There are also many sites and programs such as Google Adwords´ Keyword Planner that compare number of times a keyword or tag is search to number of sites results are found on. The goal is to have high traffic flow yet little competition. Your title should include at least two keywords and should be less than 120 characters in order to attract attention, but not be too wordy. Robert Lustig´s Ted Talk, Sugar: Hiding in Plain Sight consists of three key words: Sugar, which tells the viewer the topic, Hiding, which adds intrigue and makes the viewer ask the question ¨where?¨ and Plain, which adds controversy to his presentation. With these three keywords Lustig is able to pull the viewer in and give them an idea of the topic without giving everything away. 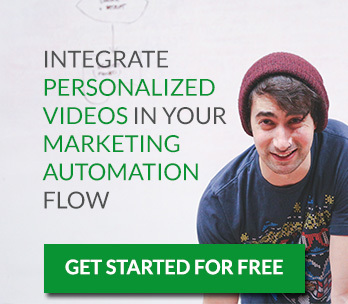 This type of highly effective videos usually work best in conjunction with your marketing and sales automation efforts. A good reading about this topic is The Power of Customer Segmentation, Automated Marketing and Personalization. The free ebook will help you better understand how to create a strategy from a B2B marketing perspective. Editing is crucial and automatically creating personalized videos can help, but there are some other simple ways to help increase lead or customer response. Research by Wistia shows that by the end of a 30-second video there are about double the number of viewers than at the same point in a 90-second-video. To put it simply: people usually do not have the attention span for a long infomercial. You want the viewer to watch your video from start to finish. We recommend 20 to 50 seconds. This means that only your most convincing and important information makes the video. With very little time to convince the reader of your benefits, wording and tone are key. A 50 second video typically has about 110 words. You must choose your words carefully, but remember it is not just what is said, but how it is said. The tone of voice of the speaker whether it’s laid back or high energy will affect how your brand is perceived. Music is another way to set the tone of a video. The key to music though is to make it enhance the information being presented, not distract the viewer. This means while there is a speaker have the music without words and play it as background noise. The beat of the music can set the tone for your whole video, so if you are trying to sell a relaxing product like lotion stay away from upbeat music. Simply put, people like interesting things. Even if your product and company are traditional or to-the-point, you still need a way to keep the viewer watching. The easiest way to make your video interesting is to either add humor or edginess. This can be in the form of jokes or interesting transitions mixed with music. It can be anything that keeps your video from being a list of facts or sounding mundane. A video that keeps the reader engaged and entertained is not a sales guarantee. One must also have an effective call to action at the end. The end of your ad should entice the reader to buy not just any product but your product. Your name and logo should be visible for around 10 seconds and contacting your company should be straight forward. One example of straight forward communication is GoPro´s ¨Dubstep Baby¨ SuperBowl Commercial which has a link to buy their product integrated into their video thanks to a Youtube feature. Ok, this is not B2B, but is a clear loved example that allows the viewer to easily access where to buy the product and makes the whole process much simpler. Now that we’ve shared some of our tips about online videos, please do share your own. What are your main tools or selling experiences with online video? Video Marketing best roi, call to action, how to create a video, online video, personalized video, sales tools, video editing. permalink. How to collaborate with other users?